Home / Adidas / Adidas adiPower Predator – First Look! 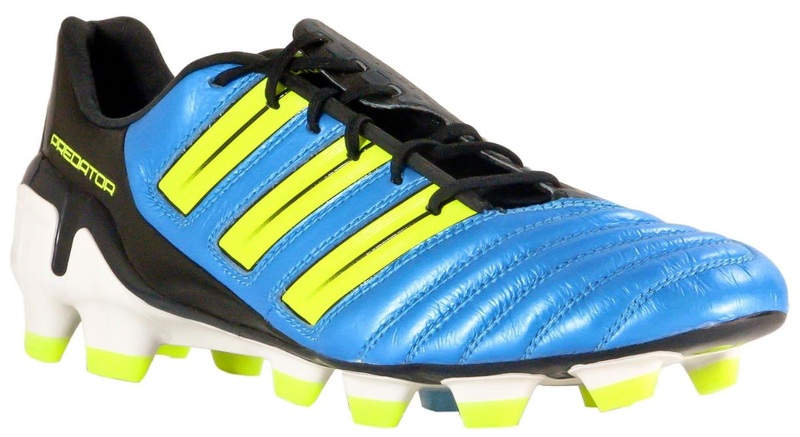 Adidas adiPower Predator – First Look! I just spotted that the new Adidas adiPower Predator is listed on the WeGotSoccer.com website and ready for pre-order, with a very tasty price of $179.99! Much cheaper than I expected. I love the design with the Sharp Blue/Electricity/Black colorway offering a fantastic and very appealing look. They weigh in at 8.2oz. Created with a Taurus leather upper (like the Predator X). Feature an all new Predator element that allows for increased swerve and ball control. Lightweight SprintFrame Soleplate (like the one used on the adiZero). Re-introduction of a PowerSpine element in the outsole, which is designed to increases shot power. Redesigned tongue and lacing system. Alcantara leather like heel lining that is designed to keep you foot in place. They have ruined the Predator line. This colours are horrid and the boot ain't much of an looker.Hope it looks better in some more elegant colourway. They also have a red and black colourway that they have used in many of their other predator releases. In my opinion, the red and black colourway looks much better. I was looking on the Liverpool FC website at some training photos, Kuyt and Maxi were both wearing the original colorway and they look way better! Now THOSE are some VERY NICE cleats! Can't wait for your review, Bryan! These are available soccer.com for preorder for $179 with goal club! I also noticed soccer.com listed that these adipowers are 7.8 oz.. Are they 8.2 or 7.8? I sure hope they are 7.8! I left a link to the soccer.com listing below. I believe the weight will vary based on the shoe size. 7.8 oz – 8.2 is almost unnoticeable. Looking forward to the review! Adidas have a size 9US officially listed as 8.2oz – once the pair for testing arrives, I will update you guys with their exact weight! wow. they reduced the weight big time which is a good thing. i dont know if adidas is going to use the adizero sole for all their boots now. the strips look thick however which i dont like. this books looks sick ~ ! gonna get one of these ! will these be made as a futsal boot? They look amazing!!!!!!! Off topic, but how do you guys think I should determine if my old shoes fit well enough or if I should fork out for new ones? How should I test the fit? A few ways I determine if I need a few pair are: they're ripping somewhere, the leather hardens or starts to decay (there are ways to delay this if you're not lazy like me), your feet grow or they become too uncomfortable for you (some never fit right from the beginning). At some point you might start to notice that your feet start to shift around in the boot more than they used to, which could be from the leather degrading or the boot just getting too old. You might experience foot cramps, toes ramming into the end of the boots, lowered performance in cuts and turns or a poorer touch on the ball. Sometimes its hard to identify the exact point when you absolutely need to buy new shoes because the symptoms can slowly creep up on you and most of the time a quality pair will feel more comfortable the longer you wear them. I've known some people to wear them until they just completely fall off their feet during a game. The main reason I get new boots is because I want to try out the new technology or because I just want to try something different. To test the fit, stand in the boot and you should notice about half a thumb between your big toe and the tip. Squat down while staying on the balls of your feet and your big toe should move into that extra half thumb length and touch the tip of the cleat while remaining comfortable. In a quality boot, this movement will cause it to mold around the rest of your foot while it is broken in. Another test is to try to arch your toes upward, toward your shins. If the boot fits right, you will be able to get a good flex in that direction and you should be able to feel your smaller toes through their respective locations on the top of the boot. Doesn't your profile on Soccer.com say you preferred playing in $40 Lotto cleats than the $200 Adidas Predators given to the UCSB team? Why are you excited about these Predators (as opposed to the ones you refused in college)? And how do you plan to provide an unbiased opinion in your upcoming review? Well, I don't want to speak for Bryan here, but these Predators are a whole new beast. This shoe is a whole new way to look at power boots. The older Preds, especially the last generation, didn't worry about weight at all. Just like Nike with the Total 90s. Weight has never been a huge topic for them both, but with Adidas taking what great success they are getting out of the SprintFrame, and including it in a power, is down right awesome. And genius. To be honest, I don't think you could call yourself a cleat lover if you weren't excited about these shoes. Ha. And Bryan is pretty good a providing unbiased opinions. Read all his reviews on speeds boots (F50, Mercurial.) We all know he prefers the Puma speed boot, but in his articles for the other ones he still points out the pros and cons of each boot. He never leans toward one side. And of course he's going to have his personal preference, we all do. But like I said, I think Bryan does a really good job at showing the boot from every different angle, performance, comfort, durability, and etc. wise. when you're playing at the highest level you should have to replace your cleats after a month. I've owned AdiZeros, Superflys, Preds, AdiPures, Tiempos… they all wear out when you're playing extremely competitive soccer. I don't know any good players with Copas out there anymore because they're obsolete cleats – they're practically barbaric. Yeah, the whole "sprint frame" and "flywire technology" isn't 100% reliable, but companies want to do anything they can to sell their cleats. I, for one, only buy top of the line cleats because you have to have the best to be the best. The durability of soft kangaroo leather is an issue–hence the tougher-but-still-soft-taurus leather. I'm glad someone else commented on this, I thought maybe I was crazy since I've never heard of k-leather with durability issues and the k-leather on all my shoes has lasted forever. And I have also personally experienced other leather types like taurus leather being much stiffer and losing their shape after some time. Will these stretch/Break in as easy as Adipures or not? these boots look classic.. thats a real design..
cant wait to recieve them..
You better get a pair of these to test. you might want to go for the black and red ones because they are not ugly. Just got a pair of these…the first thing that you'll notice is their weight (8.2 oz for Size 9, I'm sure my size 10 isn't much different), but don't get fooled by the reduced weight. They have a lot of power and I felt like they were great for me, especially because I'm a winger. Also, regarding the colorway, I don't think it's too horrid for me, I mean just look at some of the other cleats available out there..
All in all, I think this is a good cleat. It is fairly lightweight (no adiZero featherweight, but makes up for it in support, comfort, and power). These are also completely different from most of the previous generations in the Predator series, and I think Adidas did a great job with this one. Opinions will vary however..so let the discussion continue. Im currently waiting for my pair to come in. Im in love with these. when your going to do a review mate? Just got these AMAZING cleats today. They are true to size and break in perfectly. I got these in a size 9 which fit me perfectly. I made the switch from Nike to Adidas. In Nike cleats I was a Size 9 1/2 . I truly recommend these. Adidas did a great job. pread x was the end of a generation the new adipower is the begining of the new; i have been wearing preds since 2000 and as a midfeilder i love protection but to be given the best of both worlds with protection and lightweight ability it would surely make for a good weapon in your football bag. can't wait to get my new era of preads sure it will be a blast as they all were jus ask the greats. where did you see them for under $200. everywhere i look they are either $200 to $250? Read the post – it tells you where to go! I've had mine for 2 months and they are already coming apart.